Whether you’re looking for a way to get your foot in the door to another criminal justice job, looking for ideas on what kinds of jobs police officers can find after retirement, or just looking for a good, steady career, consider that working as a security guard may just be the answer. More than simply augmenting protection that public police agencies lack the resources or manpower to provide, private security is a concept older than law enforcement itself. What Do Private Security Guards Do? As the title implies, security guards provide security for people and facilities. Their duties may include making rounds to check doors and other access points, removing unruly people from somewhere, denying entry to unauthorized personnel and monitoring closed-circuit security feeds to identify and address any threats or issues as they may arise. Typically, private security guards deal with issues related to trespassing, burglary, theft, or threats to their clients. Private security officers work for apartment complexes and buildings, corporations, gated communities, retail stores, shopping malls, private universities and even private residences. 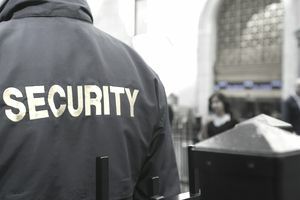 Essentially, if a private person, business or organization feels they need added protection, they might hire security guards to ensure the safety of themselves, their clients and their assets. Public buildings – even those controlled by state and local governments – may also hire security guards rather than rely on sworn law enforcement officers who could instead be put to work patrolling their communities. Private security guards are not agents or officers of the state and thus do not have the same arrest and detention powers and authority a sworn police officer has. They may, however, temporarily detain someone on the property they are responsible for until law enforcement arrives to investigate a situation. If a crime occurred, police will handle any investigation or arrest. If not, any security incident would likely be classified as a civil matter between the security guard’s employer and the involved individuals. As representatives a property owner or manager, security guards may employ appropriate levels of force in order to detain a suspected thief or trespasser or remove someone from the guards’ area of responsibility if necessary. The amount of money a private security guard can make greatly depends on the type security being performed and the person or organization a guard is working for. An individual who can hire a security guard for personal protection – such as those hired by NFL teams, for example - will probably pay much more than an organization or business might pay for a nightwatchman. In general, security guards who handle site security may earn little more than minimum wage, not unlike loss prevention specialists. Corporate security officers and managers, however, can expect to earn more, perhaps even salary and benefits. There are not a lot of requirement to get started working in private security. In fact, private security is one of the many criminal justice careers jobs that don’t require a college degree. For lower paying security jobs, you often simply need to be of good character, usually at least 18 years old, hold a high school diploma or equivalent, and be physically capable of doing the job. For the more lucrative personal security and corporate security jobs, you need to have relevant experience, either through ​several years of working in various security-related jobs or as a former law enforcement officer or investigator. Why Should You Consider a Security Guard Career? A job as a private security guard is a great way to build a resume and get the experience you need for other jobs in criminal justice or criminology. It’s also an excellent way to put prior criminal justice experience to use and augment your pension if you’re retired and looking for work. Regardless of what career stage you’re in, security jobs offer yet another great opportunity to protect and serve others.